NEWPORT BEACH — Nearly 18 months after billionaire Richard Branson’s announcement of the deep-sea exploration expedition Virgin Oceanic, the project still hasn’t left Newport Harbor. With Branson sponsoring the voyage, Newport Beach resident Chris Welsh, his 125-foot catamaran Cheyenne and a deep-sea submarine were originally scheduled to dive to the five deepest points of the world’s oceans starting last summer. Over the past year, delays, extensive testing and other missions (including dives with great white sharks and the towing and sinking of a deceased whale off San Diego) have slowed progress, but the main hindrance remains the slow progress on an integral part of the submarine: the windshield. 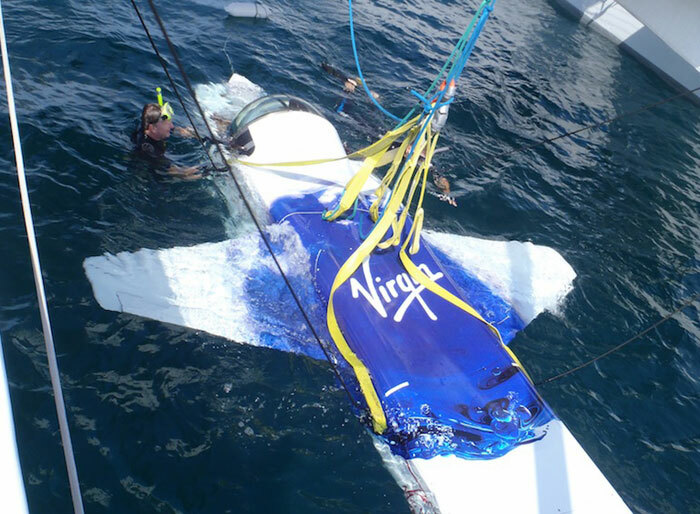 Welsh purchased the submarine and the round-the-world record-setting catamaran formerly owned by the late Steve Fossett, who had been planning to do his own diving exploration prior to a plane crash that resulted in his death in 2007. The sub’s original dome had a hairline crack when Welsh purchased it in Oakland, but it has remained functional in shallow dive tests. However, for the 36,000-foot depths at the Mariana Trench, the dome must be able to withstand immense pressure, and the crew does not plan on taking any risks. Once a replacement is crafted and installed, the dome will be capable of handling up to 13 million pounds of pressure: more than twice the amount it will face at the deepest parts of the oceans. This summer, while still awaiting the new dome, Welsh and his team conducted shallow-water dive tests off Newport Beach, figuring out how to utilize Cheyenne’s crane system for lowering and lifting the submarine in and out of the water, and working out the kinks and glitches involved with a fighter-pilot-like submarine. Welsh said the team has conducted more than a dozen test dives in 150-foot depths off Crystal Cove, Emerald Bay and outside the Newport Harbor entrance, working through ballast issues, motor systems and life support systems. In their original mission announcement last year, Branson and Welsh were to alternate dives at the five deepest points in the ocean, starting with the Mariana Trench. However, things have changed. Earlier this year, while testing continued near shore, film director James Cameron and the National Geographic Deep Sea Challenge crew completed a dive in a “torpedo submarine” to the bottom of the Mariana Trench, marking the first manned dive to the trench since retired U.S. Navy Capt. Don Walsh’s descent with Challenger Deep in 1960. Now, with Cameron and his crew having already completed the Mariana Trench dive, Welsh said the order for the Virgin Oceanic dives isn’t as important. Welsh added that while Cameron’s voyage was indeed impressive, there remains plenty to explore and research at the bottom of the oceans. In addition, the airplane-like design of the Virgin Oceanic submarine allows for the craft to traverse at speeds up to 5 knots for miles along the ocean floor, compared to Cameron’s submarine, which could only transit a few meters before having to ascend back to the surface. The sub’s unique capabilities will allow Welsh and Branson to explore large swaths of underwater terrain over the course of a dive, moving along the bottom at will, documenting microbial life at extreme depths, searching out mud volcanoes along the ocean floor and mapping out uncharted areas for future exploration.